Channelling your inner Buddha albeit one of the best states to be in can be a tad challenging for some. Emotional, mental and most importantly physical wellbeing determine the cause of stress not just in us humans but even the less communicative animals like cats and dogs. In this article, we bring you enlightenment about signs to watch out for if you think your cat may be stressed! Among the many urination issues of cat, the most common one to consider a red flag is your cat not urinating at its usual spot. Also to watch out for are the usual pee clumps of your cat; particularly if they seem to be larger than before. Apart from the fact that cats are picky eaters, a cat owner must get concerned if their cat is not eating as much as it did. Sometimes they may absolutely give up on food too! A cat meowing and purring than usual is a go-to sign of not only it's trying to let you know something, but also a possible signal of stress. If your cat is usually a less talker (or purrer!) and is surprising you with its unusual pattern, you may want to take it to a vet. Cats being their selves are certainly selective about their company but if they start being by themselves entirely, you should look into it. Avoiding absolutely any interaction or contact with other beings is the most obvious hint that its isolating itself. Most cats, love to put forth their charming, good-looking side! Licking is one way they groom themselves. But keep an eye on how much are they doing it, over-licking or excessive grooming can be a sign of a possible infection, pain or another discomfort. Unlike dogs, it’s not usual for a cat to pant or gasp for air. A change in the breathing pattern is the most common sign of stress in all beings, including cats. If this scenario arises getting it evaluated from your vet is the best thing to do. 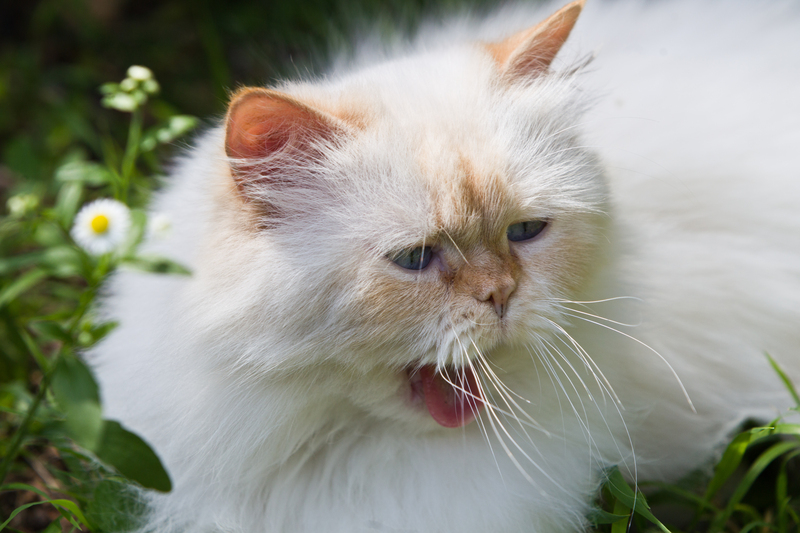 The extremes of digestion - constipation or diarrhoea are obvious indicators of your cat’s overall health. Thus, any dissimilarity in your cat’s usual bowel movement must be assessed. Being disinterested and sleeping more than how much they usually do, which is as much as twenty hours a day, is a go-to sign of stress in cats. Last but not least, unreasonable aggression towards humans and other animals indicates that they are being bothered by something and that you must intervene. Observation of any of these signs requires immediate attention and treatment. Only right evaluation from a certified vet can ensure your cat is back to its normal, happy self!